These shortbread rounds with a cinnamon edge are carefully balanced - the shortbread is melt in your mouth vanilla, with subtly cinnamon spiced edges. Unlike some of my other recipes the cinnamon really doesn't dominate. I always bake these shortbread treats in batches so that they are fresh from the oven. It makes sense to me, therefore, to split the dough in half to store in the fridge ready to bake at a moments notice. In a bowl beat the spread and sugar together until creamed. Now add the flours and vanilla and beat until nearly combined - it's really important not to over work this dough. Place half of the mix onto a square of cling film and use the cling film to create a shortbread dough sausage. Repeat with the remaining half on a new piece of cling film and pop both sausages in the fridge for at least an hour. When you are ready to bake them, pop the oven on to heat up to 150°C (fan). Prep a baking tray with baking paper. In a small bowl combine the cinnamon and sugar for the edges. Get one of the shortbread sausages out of the fridge and undo the cling-film. 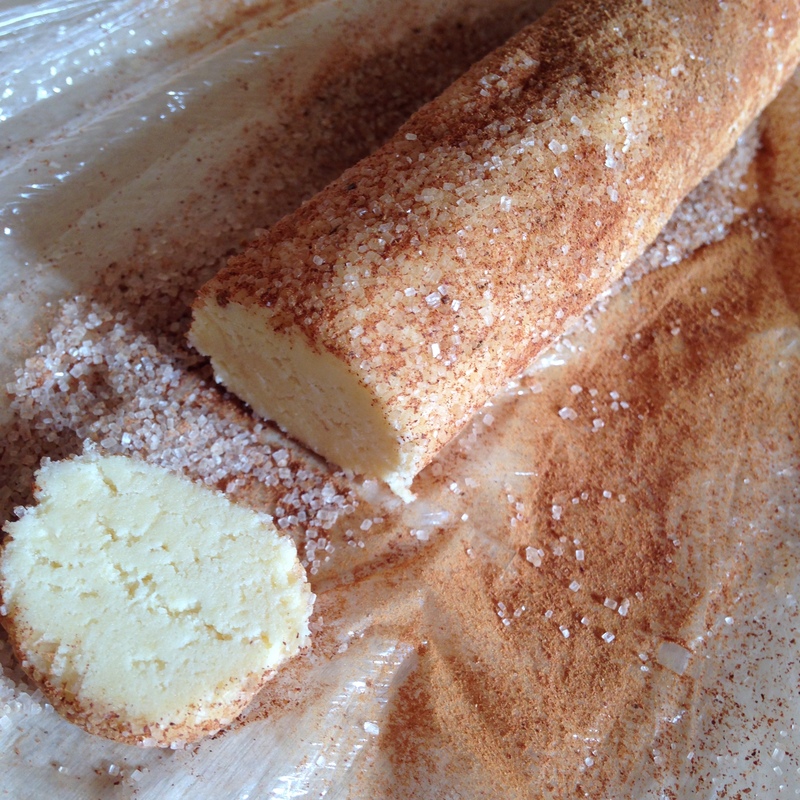 Pour your cinnamon & sugar mix onto the cling film and spread it along the edge of the dough sausage, now roll the dough through the mix so all the edges all get coated. Once the edges are covered you can cut slices to create round biscuits (go for about 7mm a slice). When you have the number of shortbread biscuits you want pop them on the waiting tray, and into the oven to bake for 14 minutes. When they come out of the oven place on a cooling rack and share as soon as they are cool enough to handle. If you're in urgent need of a shortbread fix pop the oven on at the start of process to heat to 150°C (fan) and you can work with the dough right away - be warned the dough will be softer and therefore harder to work with than if you let it rest in the fridge as recommended above.